The WPC will articulate the vital role of protected areas in conserving nature while delivering essential ecosystem services, position protected areas within the goals of economic and community well-being. The event is being organized by IUCN and the World Commission on Protected Areas (WCPA), and hosted on behalf of the Australian government by Parks Australia and the New South Wales National Parks and Wildlife Service in the Office of Environment and Heritage. Esri will demonstrate how a wide variety of organizations from around the world are using GIS software to better understand and seek solutions to real-world environmental challenges. Visit Esri at booth 43 within the exhibition hall. Esri will present the value of the ArcGIS platform for conservation planning and decision support. Live demos will be given using a variety of desktop, web, and mobile GIS tools. Attendees can see how scientists, researchers, governments, and more use ArcGIS to perform analysis and access millions of authoritative data and imagery layers via Esri’s cloud-based mapping service ArcGIS Online. By leveraging these tools you can detect changes, map trends, and quantify differences on the Earth’s surface. Esri will also show you how to use these tools to create planning and design scenarios of the protected areas where you work. Don’t miss Esri Australia’s Len Olyott showing how ArcGIS software and data is useful for land managers, researchers, and more. 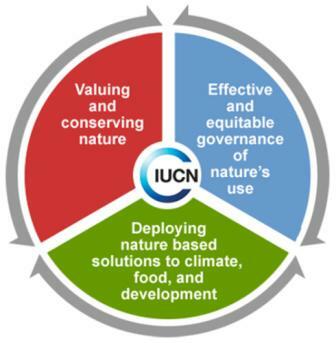 Olyott will join representatives of United Nations Environment Programme’s World Conservation Monitoring Centre, IUCN, and the European Commission-Joint Research Centre, among others, to showcase cutting-edge information technology to improve conservation and protected area management and support better decision making. The event is convened and hosted by IUCN and the European Commission-Joint Research Centre under the banner of BIOPAMA (Biodiversity and Protected Area Management), an initiative of the ACP Secretariat (Africa, Caribbean, Pacific) funded by the European Union. There will also be a variety of presentations given throughout the congress showcasing projects leveraging ArcGIS. These presentations will demonstrate real-world solutions that seek to address today’s conservation and development challenges. If you’d like to attend the the2014 IUCN World Parks Congress, you can register here.